I love blogging. Sharing my thoughts and my photos. Although I know I’m no pro photographer, I do try to take decent shots of the things that interest me and I love sharing them here on my blog. As for the writing aspect, sitting here typing away is therapeutic, cathartic almost, and I look forward to doing it regularly. I do get a little despondent when something takes me away from it. However, that does depend upon ‘what’ that something is and Toastmasters is my main distractor. But a distraction I am ok with. Writing speeches and writing blogs compete and war within me for my undivided attention, and I have to admit I cannot do both at the same time. There is another aspect of Toastmasters that takes my attention away from blogging and that’s the contest season. I love competing and doing so also requires focus, dedication, and (for me anyway) minimising distractions. Not that blogging is a distraction, but contest preparation is very important and I tend to blog less when I’m focused on competing. 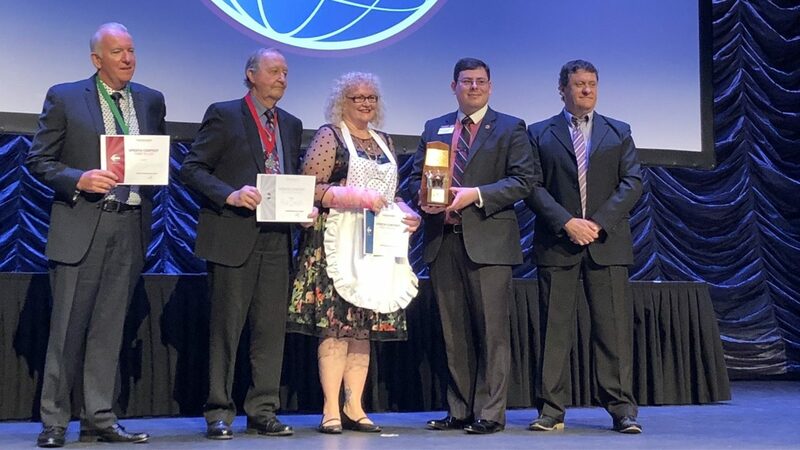 Back in March (ok, so it wasn’t that long ago), I shared my news that it was my Time To Shine when I won the Humorous Speech Contest at the Division level. Back then I said the next step was on to the District stage in April and that is exactly where I found myself this weekend just past. 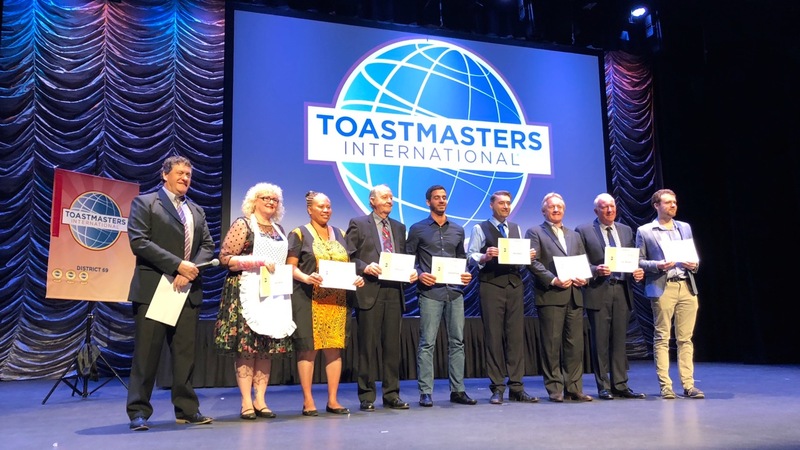 From the right, and in speaking order – Lachlan Duffy, Collin Williams, Maurie McGuire, Ray Sawyer, Joshua Pirrone, Rod Smith, Dinah Gaudi, Me, and Patrick Burns – the Contest Toastmaster. All contestants were seasoned speakers, each a champion in their own right from their respective division, and the competition was tough, the speeches well prepared and delivered with passion, precision and (in some cases) poise. There was even a bit of gusto thrown in. Contestants choose their own topics and speeches are to be delivered in a time of five to seven minutes. An experienced panel of judges mark each speaker against a prescribed judging criteria and scores are then tallied to confirm the placegetters. Also in the photo, District Director, Ben McCormick holding the perpetual trophy for me, and the Contest Toastmaster, Patrick Burns. So I sit here this morning and share with you that I am now the 2018 District 69 Champion for the Humorous Speech Contest. I am honoured to have represented my Club, my Area, and finally my Division at the highest level in the Humorous Speech Contest. To go on to win and now be the owner of the prestigious title of District Champion, I feel both honour and pride. This was a tough competition and I thought if I did my best and made no mistakes I would be so happy and proud of myself. Even the best of the best can make mistakes, but I didn’t want to and I am glad that I didn’t. My speech flowed exactly as planned with each segment falling into place and the audience laughing at precisely the right moments. I know I worked hard to achieve this goal. I listened to the feedback I received by way of honest, effective evaluations from other Toastmasters. I paid attention to the advice I received from previous champions. I took on board suggestions regarding how I could improve my speech to ‘take it to the next level’ – the District level. They say good things come to those who wait, but good things also come to those who work for it. You cannot win a Toastmasters speech contest if you are neither prepared nor dedicated to putting in the hard work required to demonstrate your proficiency in writing and presenting speeches. I believed in myself, I had faith in my ability, and I knew I had a wonderful, highly polished speech that was very funny. Dare I say, it was hilarious. I know I worked very hard to achieve this goal. It’s one accomplishment I dared to foresee in my future and I’m still walking three feet off the ground with a stupid grin all over my face. Ok, it’s barely been 24 hours yet, but I’m sure this feeling and grin are not going away any time soon. Stay tuned. I will post it soon so you can read it. Can you see me grinning from all the way over there? I think you just might be able to. Thank you Lucy. I’m looking forward to meeting you this afternoon. As you know I loved your speech and as you said you did it perfectly. The judges would not have found it difficult to judge for the winner.You were a standout. All your constant tweaking and preparation with your natural talent has paid off . Thank you Coral. I was once told by Barrie that being assigned the role of the speaker on the agenda was an honour that deserved the respect of proper preparation. I have never failed to do just that ever since. I always thought you were funny….. Now you have proved it. Congratulations, Absolutely loved the pick – up at the end.